The cloudy skies and impending rain weren’t enough to put off 30 or so intrepid visitors who came to Lanyon to participate in a walk with Ngunnawal elder Wally Bell. 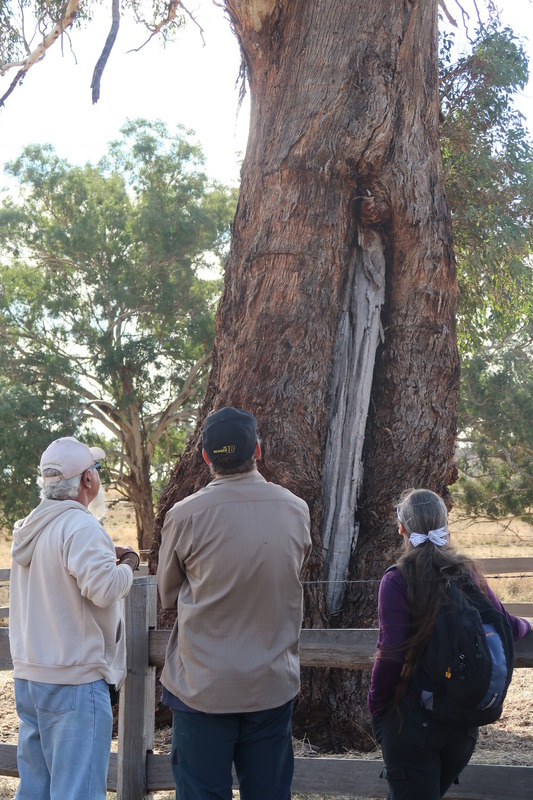 After a Welcome to Country, Wally led his attentive audience through the paddocks surrounding Lanyon Homestead to learn about the scar tree and canoe tree in the historic precinct. Wally discussed the various uses of bark for items such as shields, canoes and coolamons (carrying vessels) and explained the role of trees in the spiritual connection between the Ngunnawal people and the land. He told of his experience in finding and caring for Ngunnawal sites in the area, and how difficult (but important) protecting the landscape from development can be. Before heading back to the homestead to beat the rain, Wally took our visitors down to the Murrumbidgee, where he explained the importance of the river as a food source for the Ngunnawal people. There, he further described the methods used to care for the land by the Ngunnawal over 25,000 years- that by caring for the earth it will care for you.